Hula Networks is an authorized Ubiquiti Networks reseller with the experience and expertise to provide customers with the right equipment solutions for the best price. Use our form to request Ubiquiti Networks product pricing or information on any Ubiquiti product. Hula Has The Ubiquiti Equipment You Are Looking For...Or We Can Get It! As a premier Ubiquiti reseller, Hula Networks has direct factory direct access to Ubiquiti Wireless Networking equipment. If you need Ubiquiti, Hula can supply the equipment you need with pricing that fits your budget. Ubiquiti aims to connect everyone to everything, everywhere. Ubiquiti Networks, Inc. currently focuses on 3 main technologies: high-capacity distributed Internet access, unified information technology, and next-gen consumer electronics for home and personal use. The majority of the company's resources consist of entrepreneurial and de-centralized R&D teams. Ubiquiti does not employ a traditional direct salesforce, but instead drives brand awareness largely through the company's user community where customers can interface directly with R&D, marketing, and support. Ubiquiti has shipped over 70 million devices to over 200 countries and territories in the world. Ubiquity UniFi access points are high-performance devices that enable customers specific solutions for their variety of needs. 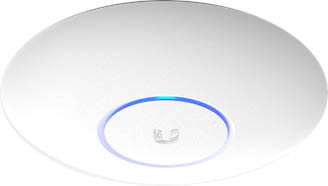 802.11ac Dual Radio Access Point - The UniFi AC Lite AP features the latest Wi-Fi 802.11ac technology in a refined industrial design and is ideal for cost-effective deployment of high-performance wireless networks. 802.11ac Long Range Access Point - The UniFi AC LR AP features the latest Wi-Fi 802.11ac technology in a refined industrial design and is ideal for long-range deployment of high-performance wireless networks. The UniFi AC Pro AP features the latest Wi-Fi 802.11ac, 3x3 MIMO technology in a refined industrial design and is ideal for deployment of maximum-performance wireless networks. Up to 5X Faster with Dual-Radio 3x3 11AC MIMO Technology. The UniFi AC Pro AP supports simultaneous dual-band, 3x3 MIMO technology in the 5 and 2.4 GHz radio bands. The World's Highest Capacity WiFi AP - 802.11AC Wave2 Quad-Radio WiFi AP with 10 Gigabit Ethernet and 1,500 Client Capacity Support. The World's Highest Capacity Wi-Fi AP - 802.11AC Wave2 Super-Capacity Indoor/Outdoor Quad-Radio WiFi Basestation with RF Channel Filtering and Directional Beam Shaping Antenna Technology. Powerful enterprise ready routing and switching solutions at an incredible value. Enterprise Gateway Router with Gigabit Ethernet - the UniFi Security Gateway Pro extends the UniFi Enterprise System to provide cost-effective, reliable routing and advanced security for your network. 10G Rack-Mountable UniFi Application Server - The UniFi Application Server, model UAS-XG, is an Ubuntu-based Server capable of securely running all of your business applications. It integrates UniFi and UniFi Video software for centralized management of your UniFi devices. Managed PoE+ Gigabit Switch with SFP - Available with 24 or 48 RJ45 Gigabit ports, the UniFi Switch delivers robust performance, PoE+ support, and intelligent switching for growing networks. 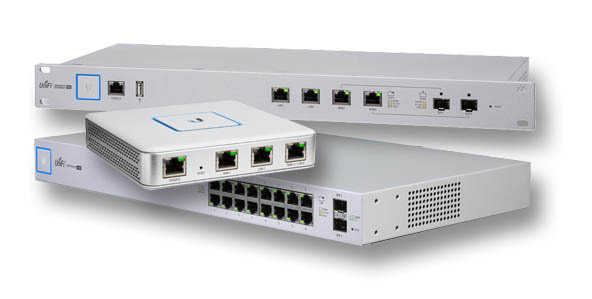 Managed Gigabit Switches with SFP - Available with 24 or 48 RJ45 Gigabit ports, the UniFi Switch is a fully managed Gigabit switch, delivering robust performance and intelligent switching for your growing networks. Managed PoE+ Gigabit Switch with SFP - The fanless UniFi Switch delivers quiet yet powerful performance with its 10 independent switching ports. Sharing a total of 150W PoE, eight Gigabit Ethernet ports offer 802.3af/at PoE+ or 24V passive PoE, and two SFP ports offer optical connectivity.. The UniFi VoIP Phones are part of the Ubiquiti UniFi Enterprise System. The base model includes a 5" touchscreen* powered by Android. The PRO model also includes Bluetooth support, Wi-Fi capability, and a video camera. Disruptive Pricing, No Fees - The UniFi VoIP Phone provides breakthrough value starting at $149 USD MSRP. The UniFi Controller software is bundled with the UniFi VoIP Phone at no extra charge - no separate software, licensing, or support fee. 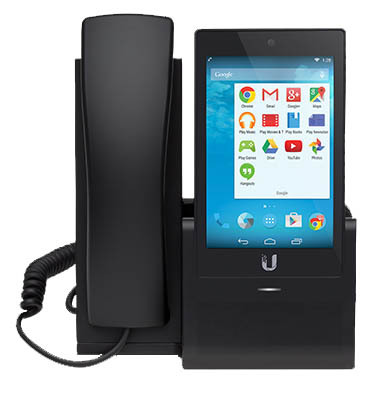 Enterprise VoIP Phone with 7" Touchscreen - Featuring smartphone technology and a full range of Android apps, the UniFi Executive VoIP Phone provides a seamless user experience to enhance work productivity.